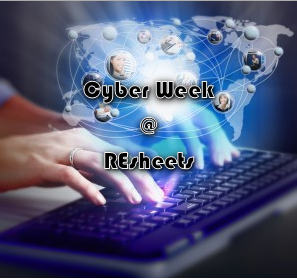 We’re celebrating Cyber Week all week long (if that weren’t obvious) here at REsheets. It’s our best discount we offer, 35% off all of our commercial real estate analysis products. Get your hands on your very own set of #CRE analysis tools with our ever-popular REsheets Toolbelt, or try our most in-depth and professional underwriting software, the Cash Flow Model Valuation Suite. Everything is 35% off.